I recently started writing a bit for the newly re-launched EGM and EGMi, which is an exciting recent development. Everyone has been raving about Limbo lately, and for good reason: It’s one hell of a game. 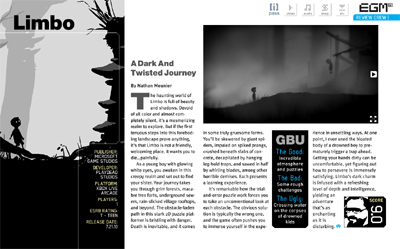 You can find my take on the spookly little puzzle platformer in the latest digital issue of EGMi here. I have some stuff going into an upcoming print issue, and I expect more work will likely follow shortly. This entry was posted in EGM/EGMi and tagged EGM, EGMi, Electronic Gaming Monthly, limbo, Review, XBLA, xbox live by nmeunier. Bookmark the permalink.